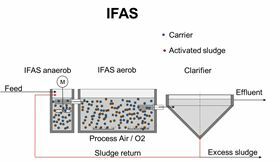 The integrated fixed film activated sludge (IFAS) system. Example for a conventional hollow-body carrier. The design and engineering of MBBR and IFAS wastewater treatment plants is full of obstacles and mistakes made can be hard to remedy. Problems can arise when unexperienced plant construction companies and plastic manufacturers without any process-technological knowledge try to copy this technology. This article explains the steps that should be taken by qualified biotechnologists to implement MBBR and IFAS systems. 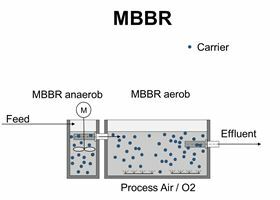 The term MBBR is the abbreviation of moving bed biofilm reactor, while IFAS stands for integrated fixed film activated sludge system. At a first glance, this seems to be a simple concept: a reaction tank is filled with a plastic-made carrier which is mixed in water or in a water/sludge mixture, respectively. The difference between IFAS and MBBR is that in the IFAS system, the activated sludge from the sludge recirculation is additionally used, which means that the combination of activated sludge and carrier-fixed biofilms is used in the same reaction tank volume. Initially, the complete task to be performed in the project should be specified. Apart from the space conditions and requirements on site, a detailed examination of the wastewater influent parameters and of the treated effluent quality is required. The size of the MBBR/IFAS tanks and the related carrier media filling rate are determined based on the pollutant loads and in consideration of specific product factors of the carrier media. Here, the loads are calculated from the flow rate (m³/h or m³/d) and the respective pollutant concentrations, e.g. COD (mg/l). Crucial factors for the dimensioning of MBBR/IFAS plants are the wastewater temperature at the design point, the yield and product specific removal rates (removal efficiency) of the carrier media chosen. Why is the water temperature relevant? For the design calculation as well as for the comparison of techno-commercial design proposals offered by different suppliers, a detailed consideration of the water temperature in the MBBR/IFAS is highly essential. An incorrect assumption of the water design temperature will have detrimental results. If the design temperature is considered to be high, e.g. 35°C, a high biological removal rate will be considered in the calculation and the carrier media requirement and reaction tank volume will be low. During normal plant operation, the temperature will be lower, for example, 25°C. At this temperature, the reaction tank volume and the quantity of carrier media will not be sufficient for complying with the discharge requirements. This means that further media will have to be added but this may not be possible because the admissible maximum media filling rate is between 50 – 70%. If the design temperature used for the calculation is considered to be low, for example, 10°C, the tank size as well as the carrier media quantity will be correspondingly larger, although the water temperature will most likely be higher in practice than assumed for the calculation. Larger tank volumes with higher carrier media fills are not necessarily a bad thing in terms of the biological aspects, but they will unnecessarily increase the investment costs. In order to obtain the appropriate design for your MBBR/IFAS plants, it is necessary to determine the minimum and maximum design temperatures and to simultaneously make sure that these values have been taken into consideration. The real requirements are often not taken into consideration by the bidder. In the case of missing data, it can happens that assumptions are made by the bidder in his/her own favour, without having explicitly asked the customer to provide the missing data. For this reason, it is very important to carefully review and compare any design proposals. If there should be the need to specify the oxygen requirement for designing the aeration system, one should keep in mind that the higher one of the two water design temperature values is used for this purpose. The reason for this is that the oxygen dissolubility in warm water is worse than in lower temperature ranges. • The lower temperature ↓ is considered for calculating the required tank and carrier media volume. • The higher temperature ↑ is considered for the calculation of the oxygen supply. Why does the yield matter? When designing MBBR/IFAS systems, the yield is another essential factor which impacts the tank size/carrier media volume and the oxygen supply. The yield is used for considering the biomass growth in the calculation; it is an ‘empirical value’ obtained in pilot trials and reference plants. It differs depending on the individual origin of the wastewater. A wrongly selected yield figure can be the reason for inaccurate dimensioning of MBBR/IFAS plants. What is the reason for determining removal rates? As mentioned above, the carriers substantially contribute to the pollutant removal (i.e. degradation of the wastewater pollutant load) in MBBR/IFAS plants and are therefore essential for optimal performance. The removal rates required for designing MBBR/IFAS plants are the measuring unit of the ‘removal efficiency’. Generally, the carrier media supplier must know the removal efficiency of his/her carrier media; otherwise he/she transfers all risks to his/her customers. Removal rates result from many years of operational experience with the product carrier, obtained from large-scale plants, pilot trials or lab-scale studies. Individual and project-specific factors such as the origin of the wastewater, specific wastewater characteristics, water temperature, and nutrient & oxygen supply have a significant impact on the removal performance. Providing general (i.e. global) removal rates is as irresponsible as copying them from other carrier types. With regard to this, further differentiations should be made. Certain types of hollow-body carriers have been used in MBBR/IFAS plants for several decades, and their relating removal rates are available from publications. Due to various disadvantages of these hollow-bodies, further research has been performed within the last ten years, resulting in a porous chip-type carrier made of foamed PE material. 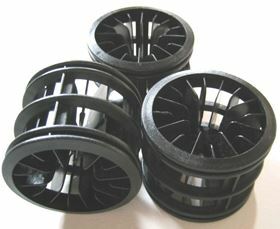 During the years of product development and optimization, the technological market leader and carrier media manufacturer Multi Umwelttechnologie AG (Mutag) made huge efforts in the process-technological application in many different types of wastewaters as well as fields of application, in order provide reliable statements in terms of the removal efficiency of this special product. If hollow-body carriers are applied, then the microorganisms immobilize on the carrier surface until they are sheared off. This fact allows for a comparison possibility of the theoretically determined surface area. This is the reason for the surface area comparison of different product shapes and manufacturers. A surface area comparison with a pore system foamed carrier will be meaningful only in a conditional way or not at all, which is due to the fact that the removal efficiency depends on the concentration of active biomass under the specific process conditions, as explained above. A comparison of the surface areas for evaluating the removal efficiency is possible only after conducting long-term comparative tests under exactly the same process conditions for the specific wastewater. 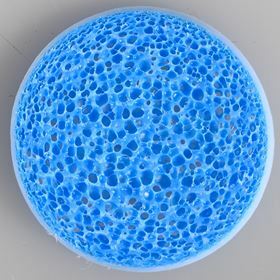 If the chip from 2008 with its pore system would have provided the same performance, it would surely not have become necessary to optimize the product to the Mutag BioChip blue™ which has an average diameter of 25 mm. It is not the surface area of the porous chips which is crucial for the removal efficiency but the quantity of biomass which can be immobilized per volumetric unit of carriers. There are dramatic differences in terms of the removal capacity when looking at pore systems, and a pure comparison of the surface areas may result in dire consequences with regard to the conceptual plant design. In order to minimize the risks of an inaccurate plant dimensioning, the removal performance of porous carriers used in the specific type of wastewater to be treated has to be proven on a binding basis, and/or the bidder/plastic material supplier must possess the knowledge of the real performance data of the finally chosen carrier type in the specific case of application. To conclude, making assumptions or estimations will not be beneficial when designing a water treatment plant and neither will a simple comparison of the carrier surface area. US business says MBBRs can improve many industrial wastewater treatment systems. Headworks has installed a MBBR process that has increased landfill treatment capacity by 209% without requiring additional footprint.